You don’t always sport the same clothes, coats and shoes throughout the entire year, let alone the constant switching of seasonal bags and scarves? Well, if you’re smart when it comes to skin, this is exactly how you’d think of a skincare routine as well. Treat it like a wardrobe where you have got to have your party prep, emergency SOS, a pick-me-up and an all-rounder that’s tried and tested – much like the little black dress! For this to happen, you’ll have to set out a task to analyse your skin under a mirror and track it’s reaction to a series of products for 25 days each. After that, you can decide what works for your skin and what doesn’t. From then onwards, create your own bespoke skincare wardrobe consisting of these tried and tested products and follow for 4 months in a year depending on that particular season. If you feel your skin has been feeling tight, taut or parched lately, especially after cleansing or when you wake up in the morning, it’s time to boost the moisture level in your skincare routine. Opt for a rich, lush night cream that will not break you out but will satisfy your skins hydration needs and help it repair and rejuvenate while you sleep. When you wake up in the morning, skin shouldn’t feel tight nor oily, just perfectly balanced and that’s when you’ve found the right night moisturiser. Opt for ones containing a bunch of vitamins, essential oils, omega oil, hyaluronic acid and antioxidants. If your skin currently has flaky bits or chapped skin, it’s a serious indication that it’s time to indulge in richer formulations. Again, if your exfoliator selection still has hints of Summer with gel based formulas and grainy scrubs, it’s time to upgrade to more winter appropriate and non abrasive formulations. This is one of the most crucial steps that most people tend to ignore during the colder months but it has a huge impact on how your skin will look during the festive period and the new year to come! 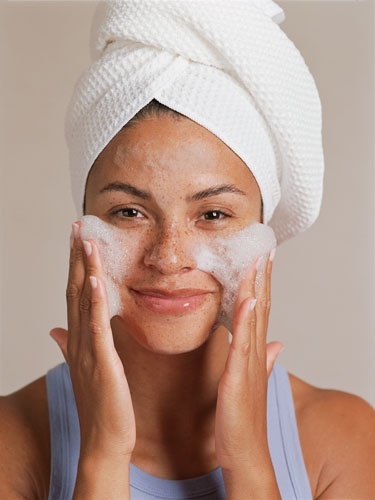 After cleansing, exfoliating is the step you should take out time to concentrate on. What you’re looking for is exfoliating toners that will do the trick for with just some cotton wool. Apply it before moisturising and let your skin work in sync with the exfoliating ingredients to peel itself, renew and resurface. There has always existed the myth that for cleansers to work properly, they must leave skin squeaky clean and stripped off it’s natural oils and moisture. Well, that’s never the true case, even in summers or even when it comes to oily-acne prone skin. Whatever your skin type or weather, cleansers need to have an element of hydration. The level of hydration it provides then depends on your skin demands and current weather changes. As for these chilly months that will greet us soon, look for a balmy textured, creamy cleansers that provides nourishment whilst it deep cleanses skin. As a rule of thumb, ensure skin never feels tight immediately after cleansing. You want skin to feel balanced yet thoroughly clean. If you always use the same skincare products throughout the entire year, this is the perfect time to shake things up a little. Opt for creamier formulas, nourishing ingredients and lustre promoting products.